The Fall of Singapore is a simulation of one of the worst military defeats in British history. From December of 1941 to February of 1942, a Japanese force of three divisions under Gen. Yamashita would force the British off the Malay Peninsula and seize the island fortress of Singapore, causing some 140,000 British, Indian and Australian casualties in the process. The campaign is a case study of a smaller but better-lead force outmaneuvering a much larger but poorly trained and ill-led opponent. The Japanese player will be challenged to match the historical result, while the Commonwealth player will have to use his resources to maintain control of Singapore and some of the airfields on the peninsula. Struggle on Bataan recreates the desperate US and Filipino defense of the Bataan Peninsula between 9 January and 9 April 1942. Though ill-equipped and ill-supplied, the defenders brought the Japanese attack to a standstill. 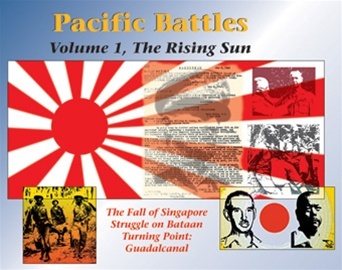 To complete their conquest of the Philippines, the Japanese were forced to bring in massive reinforcements before launching their final assault in April. The defense of Bataan, though ultimately doomed, constituted the only serious disruption to the string of Japanese victories during the first six months of the war. Turning Point: Guadalcanal is the struggle between the United States and Japan for possession of the island of Guadalcanal in the southern Solomons chain. The battle lasted from August 1942 until early February 1943 and resulted in a strategic defeat for Japan. The opponents on Guadalcanal were approximately of equal strength and with control of the seas around the island still to be decided, Guadalcanal was the last time in the war when an American amphibious operation faced the prospect of total defeat. Victory for the United States constituted its first offensive victory and marked the end of the beginning of the war in the Pacific. From Guadalcanal, the road led ultimately to Tokyo. Components: two 22x34” mapsheets, 460 die-cut counters, rulebook, player aid cards, storage bags, 1 inch box. all the rules problems are posted you will have make up your own.